1. Where was the India-Chile Business Forum held? 2. Name the organization, which release the report on food crises titled “Global Report on Food Crises” annually. 3. Reserve Bank of India has reduced its key policy rate by _________ basis point in order to enhance the growth and private investment? 4. What is the new Repo Rate revised by the six-member monetary policy committee chaired by RBI Governor Shaktikanta Das? 5. 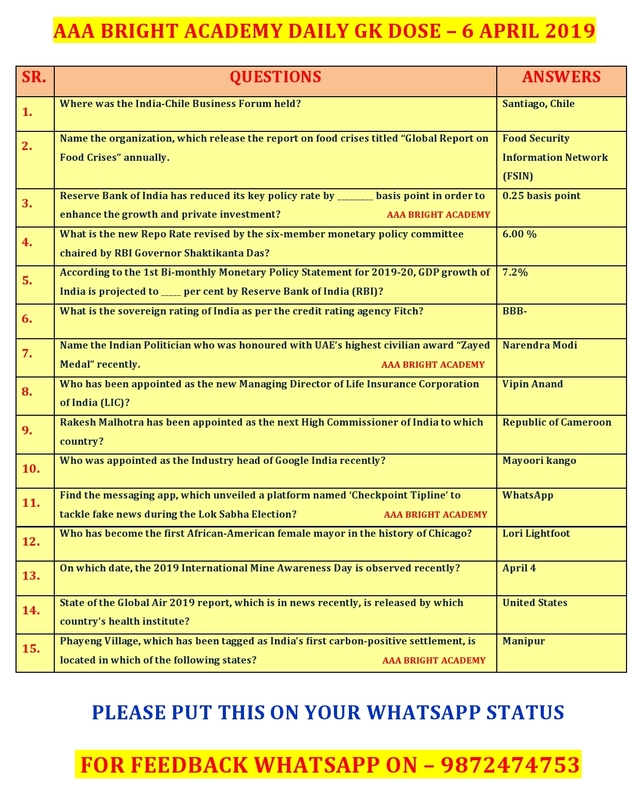 According to the 1st Bi-monthly Monetary Policy Statement for 2019-20, GDP growth of India is projected to _____ per cent by Reserve Bank of India(RBI)? 6. What is the sovereign rating of India as per the credit rating agency Fitch? 7. Name the Indian Politician who was honoured with UAE’s highest civilian award “Zayed Medal” recently. 8. Who has been appointed as the new Managing Director of Life Insurance Corporation of India (LIC)? 9. Rakesh Malhotra has been appointed as the next High Commissioner of India to which country? 10. Who was appointed as the Industry head of Google India recently? 11. 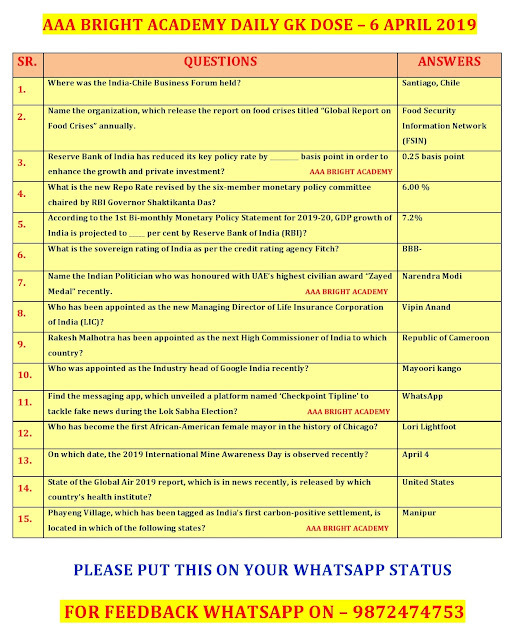 Find the messaging app, which unveiled a platform named ‘Checkpoint Tipline’ to tackle fake news during the Lok Sabha Election? 12. Who has become the first African-American female mayor in the history of Chicago? 13. On which date, the 2019 International Mine Awareness Day is observed recently? 14. State of the Global Air 2019 report, which is in news recently, is released by which country’s health institute? 15. Phayeng Village, which has been tagged as India’s first carbon-positive settlement, is located in which of the following states?